Creation: US 33 appeared in Virginia in Sept 1937 as a renumbering of VA 4 from Richmond to the west Virginia Line. Adjustments: In Feb 1939 (CTB), US 33 was removed from SR 701 in Dale Enterprise. In Apr 1940 (CTB), US 33 was removed from SR 709 in Farrington. 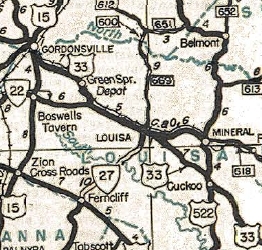 In May 1943 (CTB), US 33 was given its current corridor from Gordonsville to Trevillians as an upgrade to SR 649. Half of this distance was taken into the primary system in Sept 1942 (CTB) with no number specified, although the 1943 VDOT County Atlas labels that stub off US 15 as US 33. The old route from Trevillians to Boswells Tavern became an extended VA 22 and US 15 remained from Boswells Tavern to Gordonsville. In April 1944 (CTB), US 33 was given its current routing from Louisa to Cuckoo as a replacement for VA 248. 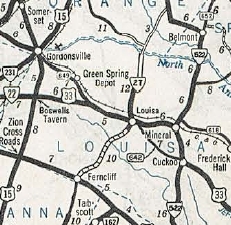 The old route became more VA 22 from Louisa to Mineral and US 522 remained from Mineral to Cuckoo. In 1944 or 1945, US 33 was straightened out between US 15 and VA 22, removing a number of railroad crossings. In Jan 1960 (CTB), US 33 was removed from Old Route 33/Hungary Rd/Old Staples Mill Rd in the Laurel area of Henrico County. About 1960, US 33 was removed from Country Club Rd in eastern Harrisonburg. In Feb 1967 (CTB), US 33 was removed from the lengthy SR 981 west of Elkton. In Dec 1967 (CTB), US 33 was removed from the lengthy SR 996 and SR 997 in Montevideo and McGaheysville. In Nov 1969 (CTB), US 33 was placed on its expressway bypass south of Elkton, leaving behind US 33 Busniess. Between 1960-72, US 33 was extended east to US 360 although it was posted to become VA 33 at 25th and Broad (VA 5). It is unclear where the US 33-VA 33 transition was for many years. See my US 33-VA 33 transition page which lays out all the evidence I have on where this has been over the years. In March 1973 (CTB), the unbuilt Stanardsville Bypass was placed into the Primary System. In Dec 1981 (CTB), US 33 east was truncated to its current endpoint at the new location of VA 33 utilizing Hancock and Harrison Sts leaving Broad St. Borad St east to US 360 remained US 250. Note the Dec 1981 CTB specifically puts the previous US 33 endpoint at US 360, 17th St. This may have been true since June 1974 when US 60 was removed from Broad St west of 21st. About 2000, US 33 was given its Stanardsville Bypass, leaving behind US 33 Business. Improvements: US 33 has always been fully paved in Virginia. In 1957, US 33 was multilaned out to today's Old Staples Mill Rd. In 1962, US 33 was multilaned in the I-81 area of Harrisonburg. In 1964, US 33 was multilaned east from I-81 area to today's west SR 996 jct. In 1968, US 33 was multilaned from the west SR 996 jct to the east SR 981 jct. In 1971, US 33 was widened from SR 981 east to the base of the ascent to Skyline Drive. In 1988, US 33 was multilaned from VA 157 to the Hanover line. In 1991, US 33 was multilaned from VA 157 south to Hungary Rd. In 1992, US 33 was widened from Old Staples Mill to hungary Rd. About 2000, US 33 was multilaned on the Stanardsville Bypass and west to SR 810. There are climbing lanes over the mountain on both sides. Posted: Fully posted; As of spring 2010 there are still a few cutouts in Gordonsville, Harrisonburg, and also at SR 842 near Montevideo; Richmond cutouts removed in mid-2000s. Error VA 33 shield on I-64 at Staples Mill Rd exit; longtime error VA 33 shield on WB Broad at Staples Mill was removed in early 2000s. US 33 is also erroneously signed on the Broad St exit from I-95. Comments: There has been some occasional confusion about US 33's eastern endpoint, even within VDOT logs. The route log explicitly states the endpoint as the intersection of Broad St (US 250) and Harrison St, while VDOT's traffic log notes the endpoint as the intersection of Hancock St and Leigh St (4 blocks NE of US 250 and 4 blocks NW of US 1/301). The city of Richmond is in charge of signage within their city, and they apparently do not place a high priority on signage, so the signs in the field are of little help in determining the endpoint. When I first explored Richmond in the mid-80s, the route was posted as US 33 from the center of the MLK Bridge west and VA 33 from that point east. So I actually thought the transition point was on the bridge. Today, Hancock/Harrison are still posted US 33 but Leigh has some VA 33 shields. The Sept 1981 CTB moved VA 33 off 25th and placed Leigh and hancock/Harrison into the primary system but labeled its sheet "US and primary state route 33" when listing segments of those streets. But because US 33 was not moved until 3 months later, and the Sept 1981 action placed Harrison/Hancock into the primary system, US 33 must therefore end at Broad St and not Leigh. US 33 is a rustic route from Richmond to Elkton, with little traffic. Below Louisa it is also full of 40 mph curves. West of Harrisonburg is quite scenic and the serious mountain curves begin right at the WV border. 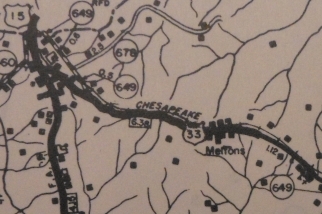 US 33 is shown as VA 33 on the 1944 Official Map Richmond inset. Dave also reports seeing a 1939 map with US 33 shown all the way to Reedville, but no other maps he or I have seen corroborate this. However, the reverse-side historical peninsula maps of the 1951 and 1952 Official Maps do show VA 33 as US 33 in the Saluda area. Like US 360, US 33 should have been extended to the Bay or at least to US 17. Creation: Appeared Nov 1969 (CTB) when US 33 was placed on a new bypass around the south side of Elkton. US 33 Business east connected to US 33 0.47 miles east of US 340 This is the 1st US 33 Business. Adjustments: In Feb 1971 (CTB), US 33 Business east was rerouted off SR 1711 Blue and Gold Dr and onto US 340 to return to US 33. Improvements: Paved upon inception; Multilane on its US 340 duplex. Comment: US 33 Business' reroute wasn't shown on maps until 1979. Creation: US 33 Business for Stanardsville appeared around 2000 when US 33 was placed on new alignment south of town. This is the 2nd US 33 Business. Comment: At VA 230, US 33 Bus is posted as TO BYPASS BUSINESS [direction].